Complete bolt on kit includes everything needed for installation. No engine removal needed and average install time is eight to ten hours. Kit comes complete with new piggy back ECU preprogrammed for your year model and is designed to work with stock ECU. No other Fuel management system is required, this is the only supercharger kit on the market which is truly a bolt on and does not require additional parts to finish the project. The kit is available for 2003 through 2008 models and is the cleanest kit on the market, perfect balance of the motor cycle is maintained as nothing is hanging of the side, also as everything is inboard there is no burning your leg. This is the most sophisticated kit out there with a proven record with all the bugs worked out, not some prototype. Optional finishes are available on the belt guard. 08 models also retain oxygen sensors. 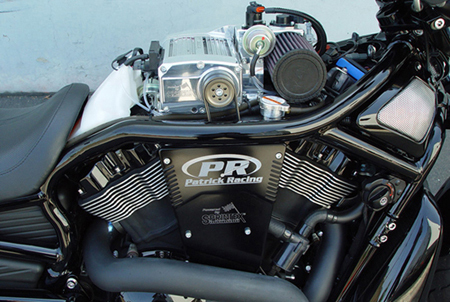 Power increases of forty to fifty horsepower at the rear wheel, instant throttle response, no more lack of power below 5000 RPM your bike will scream to the rev limiter. The kit will also run on 91 octane fuel as the latest version of the kit has full temperature correction through the ECU which adjusts the fuel curve and ignition timing. One year warranty and the best after sales support in the business. website designed by Supreme Solutions, Inc.